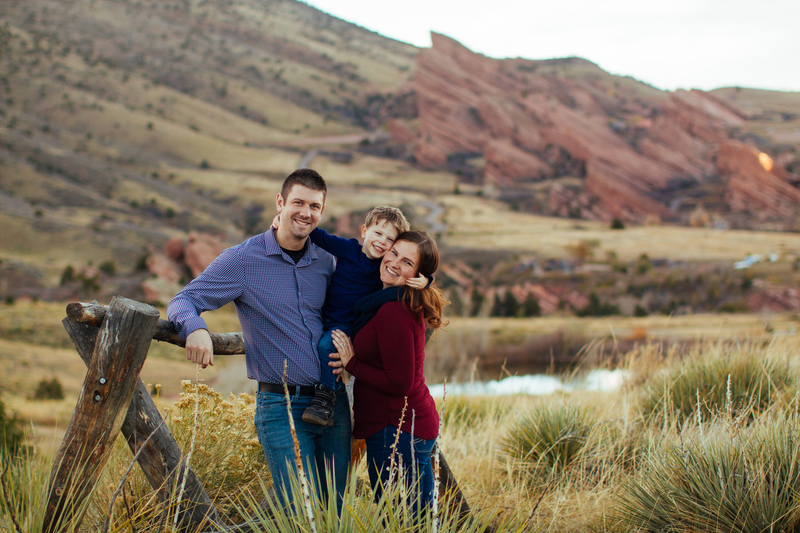 When I was compiling my 30 Before 30 list, I honestly didn’t think that going to a concert at Red Rocks Amphitheatre would be the first item that I would cross off the list. I had no tickets and no concerts in mind at that time. 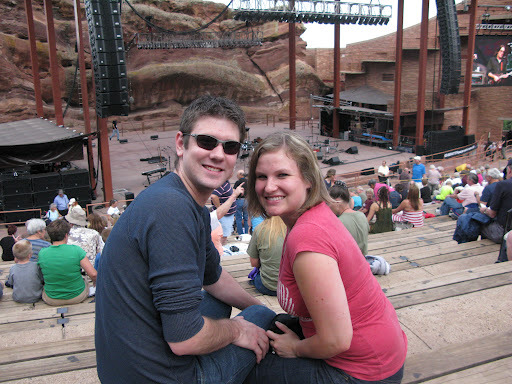 Then, about a week after making my list, we got an email asking if we would like to use Mike and Marcie’s tickets for a John Denver Tribute concert at Red Rocks. Stephen asked me if I’d like to use them, and despite not really knowing any of John Denver’s songs, we thought it would be fun to go. Already once this year, Mike and Marcie had given us tickets to see a band we didn’t know (Guster) and that turned out well, so why not? We met up with Mike’s good friend John and his girlfriend Janet, as well as their friends Phil and Barb. Stephen knows them, so we spent some time catching up before the concert started. Since they are our parents’ age, they knew John Denver’s music well and were surprised that we didn’t really know much about him. The show opened with a woman from the Lakota tribe speaking to us about how Red Rocks was the ancestral land of her people. She introduced us to a man from her tribe who came all the way from Rapid City to say a blessing over the concert in their native language. Then, drummers and dancers performed a couple ceremonial songs for the occasion, including a victory dance. It was pretty cool. Apparently John Denver was really interested in Native American culture, so it was a fitting way to open the show. Then, one of John Denver’s good friends, who put on the show, introduced a member of the Susan G. Komen Denver chapter who told us that a portion of the ticket sales from the concert would go to the local chapter to help provide breast cancer services for the women of the Denver area. Then he introduced us to the band who would be performing the tribute concert: The John Adams Band with the Colorado Chamber Orchestra. John Adams grew up in Holland and at a young age heard a John Denver song on the radio (Take Me Home, Country Roads) and was hooked. He learned to play the music and even was able to perform with John Denver once in Europe. They met several times over the years before John Denver’s death. 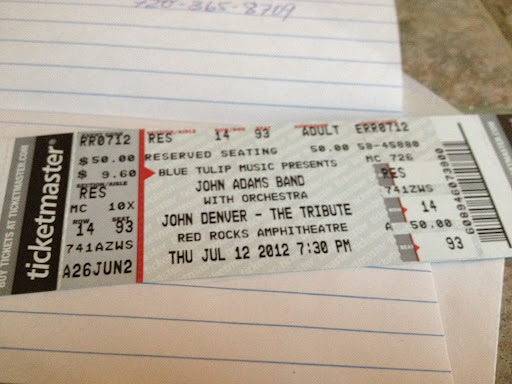 Since then, John Adams has committed his life to keeping John Denver’s music and the stories behind the songs alive. I was pleasantly surprised by how much I enjoyed John Denver’s music. I’d say I have a newfound appreciation for him. John Adams, from what John Denver fans told me, did a really good job of performing JD’s music. Some of the songs that they played were: Annie’s Song, Calypso, Take Me Home, Country Roads, Eagles and Horses, The Foxfire Suite, Grandma’s Feather Bed, Home Grown Tomatoes, Leaving on a Jet Plane, Rhymes and Reasons, Rocky Mountain High, Sunshine on my Shoulders, Thank God I’m a Country Boy, Back Home Again, Wildfire, This Old Guitar and Whispering Jesse. I’m sure I missed some, but that’s what I remember. Michael Martin Murphey was a guest performer and sang Boy from the Country and Perhaps Love with John Adams. He was really good, too. And pretty adorable in his cowboy hat and fringe covered jacket. Stephen says he looks like Chuck Norris. He’s not wrong. The only two that I could really sing along to were Annie’s Song (I had no idea that was the name of it) and Leaving on a Jet Plane. I didn’t actually know that John Denver sang those songs. It was a truly priceless experience to sit in a gorgeous venue at dusk and sing Leaving on a Jet Plane with hundreds of other people. 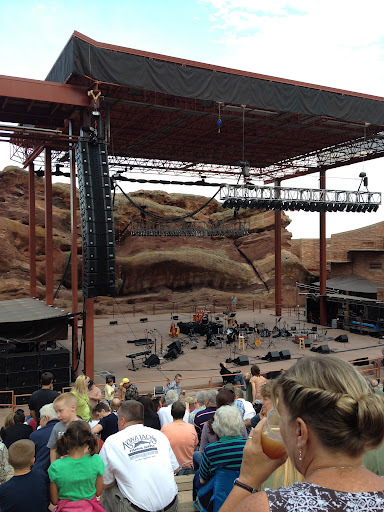 And obviously, I recognize the chorus of Rocky Mountain High, but I’ve got to say that I can’t imagine that song being performed any better than at Red Rocks, in Colorado. I’m sure it would not be the same experience anywhere else. This, right here, is why Red Rocks Amphitheatre is such an amazing and unique venue. I thought it was beautiful in the day time, but it’s even more beautiful at night. When the only lighting is coming from the stage, lights shining on the rocks flanking the seats and some strategically positioned lights around the outside of the seating area so that people can use the stairs, it’s an experience that can not be replicated. It’s beautiful. Add to that a perfect summer evening, not too hot with a light breeze, having your husband’s arm around you and some John Denver songs, it was truly romantic. I’m not gonna lie, that John Denver was a pretty sentimental guy. 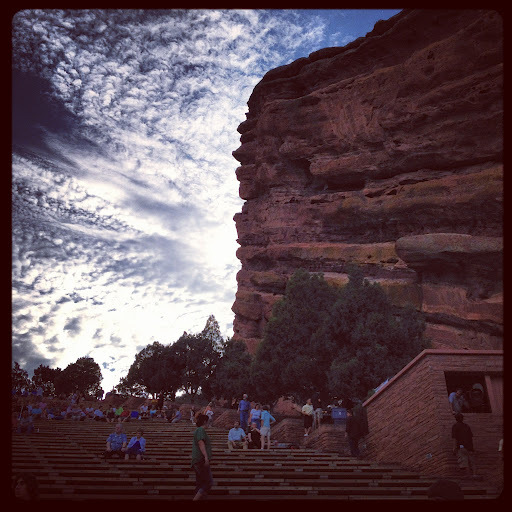 Overall, this was a great introduction to music at Red Rocks. It was very chill, laid back concert to start it off with. I hope to see more concerts there in the future (perhaps of bands that I actually know…) but I am so happy to be able to cross this one off my 30 Before 30 list. I didn't realize he sang "Annie's Song" too… I actually knew more JD songs than I thought!Looks like you had an amazing time. Can't wait to join you there sometime, I am DYING to see a show there!